The “Old Town” apartments are situated in a 14th-century building, called “Under Three Lindens”, in the centre of old Krakow, mere 200 metres from the Main Square, one of the largest and the most beautiful European plazas. A two-minute stroll along Mikołajska Street brings you to the splendid Small Square surrounded by mediaeval houses, then past the magnificent basilica of Virgin Mary to the Main Square, the hub of city life. In its immediate vicinity, there are numerous landmarks and museums, as well as a wealth of cafés, restaurants, bars and pubs. Despite its location in the centre of Krakow, this second-floor apartment offers peace and quiet with its windows overlooking the inner yard. Its interior design: the subdued colours of the walls with decorative stone elements, the original parquet floor and wooden furniture, has been adapted to the history of the building. The apartment consists of 3 rooms, a kitchen and 2 bathrooms. Each of the well-lit spacious rooms has a separate entrance from the hall. 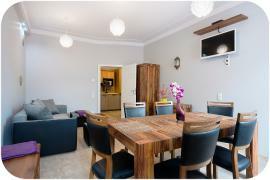 The apartment features two bedrooms, one with an en-suite bathroom and a double bed, the other with two single beds. Each bedroom is furnished with a wardrobe, two armchairs, a small table and a radio set. Both bathrooms have shower stalls and an independent heating system available throughout the year. The living room, which may also serve as a dining room and an additional bedroom with a double convertible sofa and a wardrobe, provides enough recreational space for six persons. The kitchen, with a bar table and stools, is equipped with a gas cooker, refrigerator, microwave, coffee maker, toaster and other utensils. A washing machine and an iron are available as well. The “Old Town III” is one of four apartments available in the building. Together with the “Old Town I” (2 persons), the “Old Town II” (4 persons), and the “Old Town IV” (4 persons), it offers comfortable accommodation for a group of up to 16.